I've been redesigning my blog for a few weeks now, and it's been sooooo much trial and error! I think I've really found something good though. The newest addition here is the pretty navigation bar up there! I knew I wanted something like that, but I had no clue how to do it. That's where the lovely and talented Allie from Of All The Nonsense came in! She recently redesigned her blog (go look... adorable, right?! ), and when I asked her how she did her navigation bar she was so sweet and offered to help me with mine! Thank you so much Allie!! I've been crocheting like crazy trying to get some cozy fall and winter accessories into my shop! 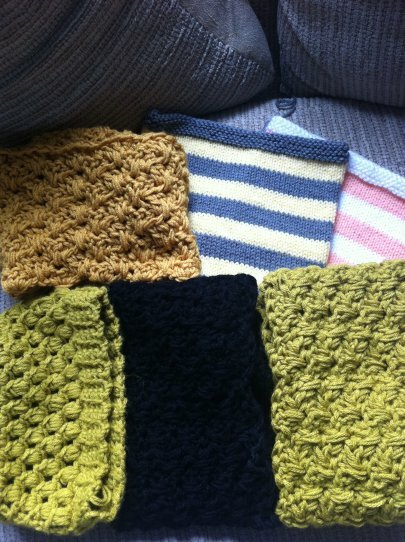 I have a stack of cowls and hats to list, I just need to take pretty pictures!! nice! I have no idea how to add a navigation bar either and would love to change mine around but am daft in that department. Your blog looks so cute! Great job! You did a great job on your blog! Your links are perfect! Wanna know the trick to lining up all your blog buttons and making them all the same width? I'm loving the new design...that nav bar is quite spiffy! Totally cute redesign! Love the colors and textures on the header.